As the second afternoon of dynamic tolling for solo drivers inside the Beltway on Interstate 66 closed, tolls were running about what they were Monday at the same time. Meanwhile, a Republican Virginia delegate is calling the morning tolls, which peaked Tuesday at $40, "just wrong," and plans hearings and possible legislative changes. 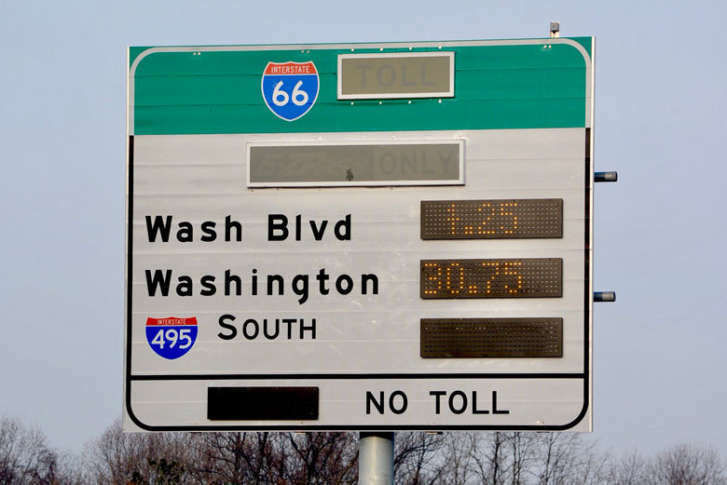 WASHINGTON — The second afternoon of dynamic tolling for solo drivers inside the Beltway on Interstate 66 began with a bump, but as the Tuesday rush hour drew to a close, tolls reached nothing like the Tuesday-morning peak of $40. The fluctuating tolls along the 9-mile stretch are in effect from 5:30 a.m. to 9:30 a.m. eastbound and 3 p.m. to 7 p.m. westbound from the Capital Beltway to D.C.
At 3:08 p.m., the toll for the full 9-mile stretch from Route 29 in Rosslyn to the Beltway briefly spiked to $12.50, according to the I-66 Express Lanes toll calculator, before falling to $6.50 a few minutes later. It stayed between $5.50 and $8.75 the rest of the afternoon. As on Monday, the Tuesday morning rates were higher, reaching $40 at 8:09 a.m.
On Monday, the peak inbound toll was $34.50; on Monday afternoon, the maximum toll was $12.50 at approximately 6:15 p.m., but stayed below $10 for most of the afternoon and evening commute. Hugo said he’d hold hearings “why they’re having $40 [tolls] when they promised six or seven dollars,” and would consider introducing legislation to roll back the expansion of rush hour and/or put a cap on tolls. Jennifer McCord, a spokeswoman with the Virginia Department of Transportation, said there are a few reasons afternoon toll rates were, and are expected to remain, lower than morning tolls. “There is more capacity westbound, after two widenings in recent years, than eastbound,” said McCord. In addition, the typical weekday traffic pattern is different in the afternoon than in the morning, in both duration and flow. “The exit pattern is typically more spread out,” said McCord, with people leaving the District throughout the afternoon and early evening, compared with the more compressed morning inflow. “Several freeway connections converge eastbound, including 495 northbound and southbound, as well as the Dulles Toll Road and 66 inbound,” she said. McCord likens the morning convergence to a funnel, with the District at the narrowest point, while the afternoon and evening exodus provides enables drivers to more easily exit I-66 at a variety of locations. Under the new rules, drivers must have at least one other person in the car and an E-ZPass Flex switched to High Occupancy Vehicle mode. All other drivers will be charged a toll that rises and falls based on the amount of traffic in the lanes. The aim of the tolls is to keep traffic moving. As demand goes up, so does the price. On Tuesday morning, VDOT said, the average speed for the I-66 express lanes was 54 mph, up from 37 mph last December. On Monday, VDOT said, the average speed on I-66 during Monday’s morning rush hour was 57 mph, up from 37 mph at the same time a year ago.